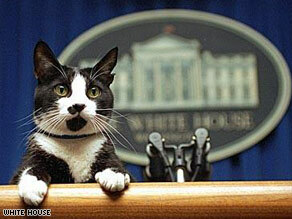 WASHINGTON (CNN) -- Socks, the cat who won international fame during his years in the Clinton White House, was euthanized Friday after months of treatment for cancer. Socks was adopted by Chelsea Clinton when her father was governor of Arkansas. Socks, who was born in 1989, was put to sleep about 10 a.m. at Three Notch Veterinary Clinic in Hollywood, Maryland, said veterinary assistant Rae Dera. Veterinarians say he was probably either 19 or 20 years old. The cat had been losing weight since November and had been treated at the clinic, Dera said. He had been suffering from a cancer in his mouth and jaw.